The panel discussion “Diversity as Democracy?” featured moderator Haruko Yamauchi and participants Jen Hoyer (Interference Archive), Emily Drabinski (Long Island University-Brooklyn), and Shawn(ta) Smith (Graduate Center, CUNY). Yamauchi asked the panelists to define diversity and to include specific examples of what they have done to increase diversity in their organizations. Shawn (ta) Smith-Cruz is Reference & Instruction Librarian at the Graduate Center, CUNY, and a volunteer archivist at the Lesbian Herstory Archives. Smith mentioned that CUNY’s LGBTQ studies center has a queer agenda and that Lesbian Herstory hosts seminars that offer alternative arguments in the struggle against existing social structures. She defined diversity as doing work that is not within the norms of one’s organization and acting as change agents to “chip away” at institutional structures: “We have the ability to transform institutions,” she declared. LGBTQ inclusivity, she added, should be central to diversity agendas. She further argued that efforts to increase diversity in the workplace must be collaborative: librarians must reach outside of the library and work with other actors in the larger institutions. Jen Hoyer discussed her work at Interference Archive, an open-stacks archival collection and study center dedicated to objects created as part of social movements. A volunteer-run institution, it provides equitable access to archival collections that reflect different ways of being in the world. Faculty can bring students to visit the archive, where they are allowed to touch items—a somewhat unusual practice in light of the traditional archival focus on preservation. Hoyer argued that, in contrast to that traditional approach, providing access to materials is actually a form of preservation. Another unconventional choice Interference Archive has made is not to provide standard search avenues for the discovery of its collections. Instead, researchers are obliged to browse; they thereby necessarily become familiar with parts of the archive they were not explicitly seeking. In response to moderator Haruko Yamauchi’s remark that “sometimes we need to redefine what we do (what we can archive, and who can archive),” Hoyer responded that sometimes an archive’s volunteers want to make a change, but are reluctant to do so for fear of being wrong. At Interference, they are encouraged to take such chances. Smith noted that some of our libraries are closed access, which can decrease inclusivity. Yamauchi then asked the panelists to discuss the largest challenges we face concerning diversity and what we can do to increase diversity in our institutions. Smith highlighted the tension between librarians and faculty status as a key challenge: our identification with our library or archive institutions can create a strain between our identification as librarians or archivists and our desire to act on our faculty status. Librarians are often excluded from faculty collaborations, Smith pointed out. To illustrate, she related an incident from her own experience in which a group of faculty activists counted women of color among the faculty, but neglected to include Smith in their count. She emphasized that librarians must make an effort to engage with non-librarian faculty in order to help increase diversity among personnel. She also highlighted the relationship between faculty diversity (or lack thereof) and diversity among non-librarian library staff. It is difficult to increase library staff diversity when the disciplinary faculty is not diverse, she suggested. Drabinski called attention to a related tension between professionalism and diversity, two ALA core values. Gatekeeping—necessarily exclusionary—is part of professionalism. She pointed out that exclusion and inequality in the profession limits salaries and professional development and that we not only need to hire more people of color, but that we need to be aware that it is legal to hire preferentially in order to do so. She also emphasized that existing cataloging practices present obstacles to the inclusive discoverability of works by or about people belonging to minority categories, and that lack of spending and other resource allocation on cataloging exacerbates this situation. Yamauchi and Drabinski then turned the conversation to the question of power. Increasing diversity, both agreed, involves giving up or sharing some degree of power. Moving toward Open Access, Smith offered, is one form of power sharing. Drabinski argued that collective bargaining and union organizing is a crucial part of equitable power redistribution. Union work is difficult and heartbreaking, and progress can be slow, she acknowledged, but it is completely worthwhile. Smith urged academic librarians to become part of the solution by joining committees whose purpose is promoting diversity. It is important for people to step out of their comfort zones in order to take part in the privileges of governance that come with faculty status. Drabinski pointed to one source of discomfort: nine times out of ten, librarians participating in faculty committees are asked to take the minutes. Miranda McDermott is a librarian at the New York Public Library. 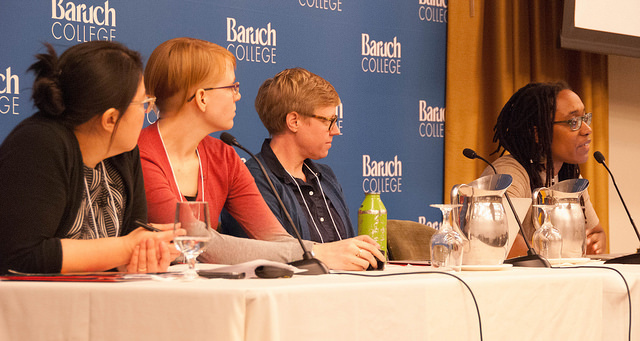 Read her blog post on the 2015 Symposium here: http://www.nypl.org/blog/2015/12/10/acrlny-conference . She may be reached at mirandamcdermott@nypl.org .